– Wash surfaces and utensils after each use, because bacteria can spread to cutting boards, utensils and countertops. 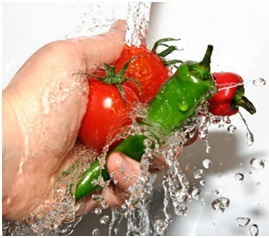 – Wash your fruits and veggies before cooking or eating, but not meat, poultry or eggs! Why not meat, poultry or eggs? Washing the raw meat can help bacteria spread, because the juices can splash onto your sink and countertop, contaminating them. All commercial eggs are washed before they are sold. Extra washing runs the risk of cross-contamination, especially if the shell is cracked. – Use separate cutting boards and plates for produce and anything that requires cooking. 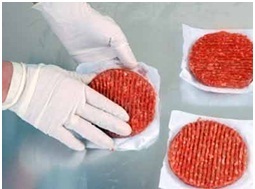 Having ready-to-eat food on a surface that had raw meat on it can spread the bacteria from the raw meat’s juices and make you sick. Before using the surfaces again, wash the cutting boards, utensils, plates, etc. thoroughly after the raw meat is removed. As soon as your cutting board starts to become worn and begins to have grooves in it that are difficult to clean, replace it – bacteria likes to hide in places you can’t reach! – Use separate bags for your raw meat, poultry and seafood to avoid contaminating the rest of your food. – Keep your raw food away from all other food in the refrigerator. If you aren’t planning on using these foods in the next few days, put them in the freezer instead. 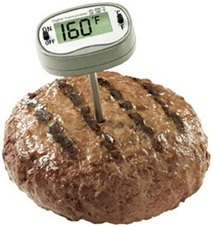 – Use a food thermometer. Color and texture alone won’t give you 100% certainty that your food has been cooked thoroughly enough to kill harmful bacteria. Some foods need 3 minutes of rest time after cooking to make sure that the harmful bacteria are killed (it keeps cooking even after being taken off of the heat source). – Keep food hot after cooking and before serving. Be sure to use a chafing dish, warming tray or slow cooker in order to keep your food warm before serving. Bacteria thrives while the food cools after cooking due to the drop in temperature, so be sure to keep the temperature of your food over 140 degrees Fahrenheit. – When microwaving your food (whether it is freshly made or leftovers) be sure to stir your food in the middle of heating. This allows all of the food to be cooked evenly, killing the bacteria that may be underneath. – Refrigerate perishable foods within two hours of cooking or using them. Since cold temperatures slow the growth of harmful bacteria, it is important to be sure that your fridge is not overstuffed (this will allow the cold air to circulate better throughout your fridge). 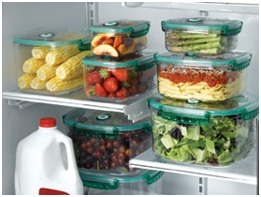 Divide your leftovers into several clean, shallow containers and they will chill faster. Thaw it in the refrigerator. This is the safest way, just be sure to place the meat on a plate or pan that will catch the juices that could leak out of the package. If you’re marinating your food, the refrigerator is the best place for it. Thaw it in cold water. Just remember to change the water every 30 minutes or so, and cook the food immediately after it has been thawed. Thaw it in the microwave. This is the fastest way, but the food must be cooked immediately after. Cook it without thawing. It is safe to cook food without thawing it, but your cooking time will be about 50% longer than it would if the meat was thawed. – Know when it’s time to let go – you can’t tell whether harmful bacteria has begun growing on your food just by looking or smelling it. Click here to see FoodSafety.Gov’s Food Storage Chart. Always keep to these four steps and you’ll be sure to always keep those harmful bacteria away from your food. Food poisoning-causing bacteria are everywhere, and it is very important to know how to buy, store, prepare, serve and keep prepared food properly to avoid getting sick. To learn more about proper food safety, visit http://www.foodsafety.gov/. The WHO adds another food safety key: choose clean, good quality ingredients (i.e., clean water, pasteurized milk, fresh eggs, and so on). Check dates on cans and boxes. See that your fruits and vegetables are fresh and in good condition. That’s a great point, and a very important food safety tip. Thank you for commenting!